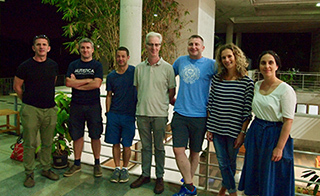 Five members of the Centre for Developmental Neurobiology (Darren Williams, Juan Burrone, Martin Meyer, Anthony Graham and Richard Wingate) have received funds from Global Engagement - King's Worldwide to visit the National Centre for Biological Sciences to participate in a workshop to develop collaborations and foster links between NCBS and King's. NCBS is a premier research institute funded by Tata Institute for Fundamental Research looking at all aspects of basic biology from the ecosystem level down to single cells. NCBS is a forward thinking and globally connected institute with a strong graduate training program. The party will make a six-day trip, visit labs and present their work. Members will also visit the Science Gallery Bangalore, which is twinned with our Science Gallery on Campus. This trip will help strengthen communications, foster links and bring about meaningful collaborations between the interested parties. Earlier this year Darren Williams received a BBSRC India Partnering Award to support collaboration with Sanjay Sane (NCBS). Sanjay and Darren have helped identify pairings and enabled preliminary conversations to take place. The goal of this exercise is to help broaden scientific horizons, obtain funding for exchanges and eventually acquire salaries for dedicated graduate and postdoctoral positions to work on joint projects.